Get set to grow during May half term with garden-themed activities and family events at the RHS Gardens. Get hands-on at the Family Gardening Festival (25 May – 2 June) with wildlife, flower power and plot to plate activities. Explore the music maze, made of recycled musical instruments, and follow Goose on a trail through the Pinetum – look out for wildlife sculptures from Surrey’s The Sculpture Park along the way. Get your hands dirty at the Children’s Gardening Weekend – designed to inspire the next generation of gardeners (Saturday 25 and Sunday 26 May). Explore the garden with a family garden trail (25 May – 2 June) and Get Set, Grow! with craft and garden workshops (27 – 31 May). Don’t miss the birds of prey (Thursday 30 May) and beekeeping demonstrations (Saturday 1 June). Explore the garden with our family garden trail (28 May – 2 June) and get set to grow with daily craft and garden-themed activities (28 – 31 May). Join the Mad Hatter and friends for an interactive performance of Alice in Wonderland (Tuesday 28 May, booking essential). Explore the garden and learn about fruit and vegetables with the Garden Detectives’ trail (25 May – 2 June). Drop-in for craft and sow and grow workshops (Wednesday 29 and Thursday 30 May). Don’t miss the pottery and ceramic exhibition by the Anglian Potters (25 – 27 May). From family events to flower shows and guided walks and talks, there is plenty for everyone at the RHS gardens. 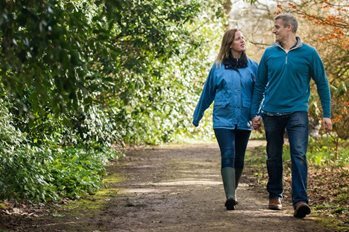 I enjoy a refreshing walk… my membership gives me free family days out as often as I like.